2- top banking system: making money out of nothing * FEDERAL RESERVES in USA. 5- What happened to these flying machines after the war? Why they - the world leaders and the military - keeps secret of the ufos. "Almost all the secrets have to do with the past of our planet, the history and the origin of humanity (how and where? ), the reason for our being here, the so-called UFOs and the consequences thereof (UFOs = Unknown Flying Objects, the common name for flying devices with two counter-rotating magnetic fields, mostly cigar- or saucer-shaped and of terrestrial or extraterrestrial origin). I presume that the word UFO is not welcome to some. That is why it is so important to be open for new things! And the subject of UFOs is not new, on the contrary. People in Europe have been just as misinformed as everyone else upon this Earth where UFOs are concerned. And that again has to do with the Illuminati who control the media! Beside the "THULE-GESELLSCHAFT" (Thule Society) which will be described in detail later, there was another secret order in the Third Reich, the "VRIL-GESELLSCHAFT". This was mainly occupied with the building of UFOs. They had, next to Viktor Schauberger and Dr. W. 0. Schumann, also Schriever, Habermohl, Miethe, Epp and Belluzo working for them, whose developments will perhaps be remembered by the British and American pilots still alive as "Foo Fighters". 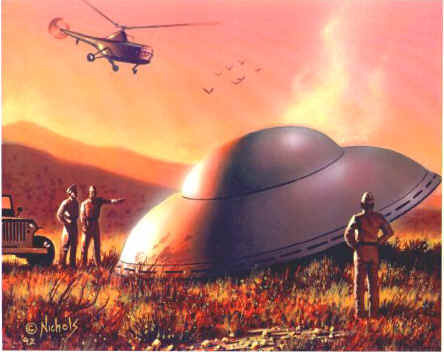 Their developments was greatly accelerated after according to them - an "extraterrestrial" saucer went down in the Black Forest in 1936 and was hardly damaged. After having scrupulously studied the drive and having joined the findings to the already enormous body of know-ledge of the "Vril-Gesellschaft" about implosion and antigravity - they started to build their own prototypes. Developments like the "vril-7" (V7), a disc-shaped supersonic helicopter (not to be confounded with the V1 and V2 cruise missiles) were so astounding that today's stealth bombers look like toys in comparison. The Vril-7 developed by Richard Miethe for example and equipped with twelve BMW 028 turbo-units reached in a test flight in Peenemunde on February 14, 1944 in vertical take-off the height of 24,200 metres and in horizontal flight a speed of 2,200 km/h. By the end of 1942 several units of the circular aircraft RFZ 6 with the name "Haunebu II" had already been built. It had a diameter of 32 metres and a height at the central axis of 11 metres and near the ground it reached a speed of over 6,000 km/h. It had an operational range of 55 hours, took off vertically and could fly horizontally, vertically and - most importantly - manoeuvre at right angles (a movement typical of all the UFOs observed all over the world). Later Vril developments were even more successful, as early as the beginning of 1945 they succeeded in flying around the globe in a few hours. A large-capacity version of the Haunebu II had a dia-meter of 120 metres and had integrated sleeping quarters. Just think why one would need sleeping quarters if one could fly around the world in a few hours? (More about the 'Vril-Gesellschaft" and its developments in the chapter named accordingly). Many will now ask: "Why did Hitler not win the war if he had technologies like these at his disposal?" The reason is that although a large number of these flying disks showed incredible performance, yet they were well high unusable in a military context. The reason was that the magnetic field produced by the levitation drive acted like a protective shield around the craft and, while it rendered it almost impossible to shoot down, was almost impossible for the conventional" weapons carried to penetrate without "friction". The projects were under the supervision of the "Vril-Gesellschaft" and of the SS E IV (Secret IDevelopment Centre for Alternative Energy of the SS), i.e. they were not directly under Hitler's and the NSDAP's orders and basically were not planned for war use. Only later when Germany's situation deteriorated did one think about using the flying disks in the war. Another reason is that most people have no idea what Hitler's real aims were, where he had been educated, of which lodges he was a member, whose ideology he adopted, who put him in his position, who financed him and what reasons there were behind the Second World War. Hitler's ideology had nothing to do with what we call today the "general reality" and with what is told about the Third Reich in schoolbooks. Hitler was a mystic and an occultist down to his shoes, and to understand what happened in the Third Reich one has to look at it from this viewpoint, too. To most "materialists" among the historians, the Nuremberg Trials were a mixture of Grimm's fairy tales and stories from the mentally sick, because they were unable to think themselves into the roles of the defendants, nor had they the necessary knowledge to understand the stories these people told. Dieter Ruggeberg puts this very aptly: "Only an occultist can recognize an occultist!" The chapters about the "Thule-Gesellschaft" and the Vril-Gesellschaft" will explain the ideology of these people in more detail. Hitler and his secret societies knew a lot more about the origin of humanity, the structure of the Earth, antigravity and "free energy" than we are taught today. That is also why all writings and books that could divulge this knowledge were removed or banned by the Allies, to ensure that humanity will remain easily manipulated. The Allies' main interest were the technologies of the Vril-Gesellschaft". These were the best-kept secrets of the Third Reich. The Russian got their hands on the construction designs first, the scientists like Viktor Schauberger and Wernher von Braun became - in the operation "Paperclip" - the prey (bytte) of the Americans. The resulting developments of flying machines are under the highest security rating of the U.S. of A. They were also the reason why J. F. Kennedy had to die (see the chapter "The Kennedy Assassination"). There were though quite different experiments conducted in the Third Reich which would all but destroy the views of the world so far erected by the readers if given here. Therefore they will later be treated separately. Why have most people never heard about these things? For instance about the founding of the German state "Neuschwabenland" (New Swabia) in the Antarctic during the Second World War? And why did U.S. admiral Richard E. Byrd require almost 4,000 armed troops, an aircraft carrier and full military support when he went to explore the Antarctic? And why did only a few hundred of them return? Many open questions. Why have only few people heard of these things, or of the developments of NIKOLA TESLA, among which were free energy machines, energy transfer without cables, antigravitation and the changing of the weather by the aimed use of "standing waves"? What consequences would the knowledge about free energy forms and about the use of flying saucers, which only use a magnetic field for an energy source, have? Especially if every citizen would have access to it, for their cars for example? No more "Fill'er up!" No pollutants, no pollution of the environment. No nuclear power stations any more, people could no longer be kept locked within the boundaries of a country, and we all would have more free time because we wouldn't have to work to pay for heating, petrol and electricity (in this time one could think a lot, perhaps about the meaning of life). And these energy forms exist. The have been existing for at least ninety years and have been kept secret all this time (more in "Further Reading"). Why were they kept secret? Because people on this Earth are controlled by energy, food and the retention (tilbakeholdelse) of knowledge. If the knowledge about these things and their use would be available to all, the Illuminati or other egotists could no longer play their power game. Churches, sects and drugs would lose their importance. Therefore it is imperative for the Illuminati to keep these things from the rest of the world, in order to feed their greed and their ego with their might. This was a side trip just to show that the UFO theme is more explosive and real than many would have it. The "strategy of ridicule" used by the Anglo-American establishment has so far cost several billion dollars, just to denigrate the UFO theme by the mass media successfully. On top of that: The first law in a secret lodge is never to be mentioned publicly, even saying the lodge name by a lodge brother is punishable by death in certain cases (in the "99 lodge" for example). Secrecy is a proper power. It allows the execution of operations without them being hindered by legal entanglements or potential opponents, and it also fosters the interchange of higher knowledge among the knowing. LINK TO PART ON GERMAN UFOs from before ww2. SECRET SOCIETIES of Jan van Helsing (pseudonym) as audiobook mp3 - 38parts a 30min. same on german - its a german production: from Michael Dambøck Verlag, A-3321 ARDAGGER, MARKT 86.